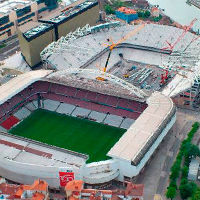 31.05.2013 Madrid: Real to sell naming rights? This would require the socios’ approval, but isn’t impossible. 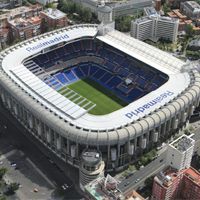 The main aim is to maximize profits and finance the major revamp of Estadio Santiago Bernabéu. So Emirates Santiago Bernabéu, perhaps? 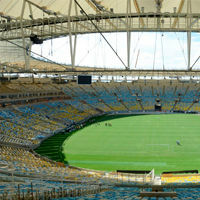 The famous stadium in Rio was yesterday ruled unsafe to host the kind of game that is planned for Sunday. 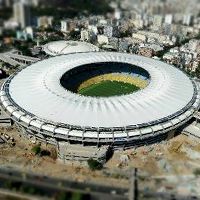 Brazil-England friendly will take place, though, as today state authorities managed to get the safety certificate required. 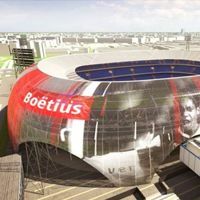 The choice is between building a new arena next to De Kuip (€313 million) and redeveloping the current stadium to a similar standard (€117 million). What will Rotterdam support? Unexpectedly a leaked email revealed mayor and council members in favour of the more expensive solution before even analyzing both bids properly. In 2015 Sunderland fans or other event attendees will be able to sleep just meters away from Stadium of Light as plans are announced for a new Hilton hotel in Sunderland, just next to the football ground. Construction Enquirer report. 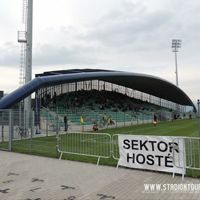 Today we present to you two stadia from the Czech Republic and one from Slovakia, all of which are rather small, but still really interesting. A bit like Slovakia and Czech Republic themselves – small countries, but with great football spirit (and history!). Stadium managing group released a statement in which they blame erroneous installation of the roof membrane for the Monday accident. 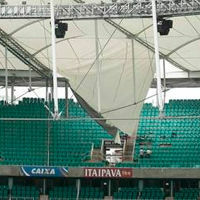 Repairs are already ongoing and Arena Fonte Nova is to be safe for 2013 Confederations Cup. 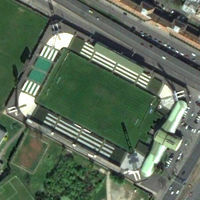 Instead of growing ahead of the tournament, Stade Bollaert-Delelis will be downsized. This comes as authorities attempt to improve comfort for all groups of spectators. Limited budget also played a role, though. 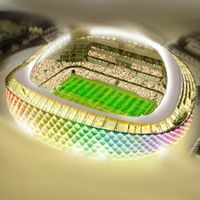 The Qatar 2022 Supreme Committee appointed Amsterdam Arena and IMG as the Stadium Operations Consultants for the 2022 FIFA World Cup Qatar, ameinfo.com reports. 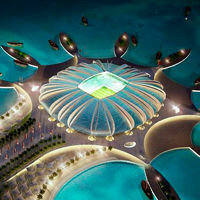 The cooperation will provide optimum management for the 2022 venues both during and after FIFA World Cup. 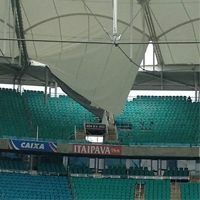 One of the membrane sheets spanning over the stands in Salvador gave way under the weight of water gathering on it. Similar accident was prevented from happening at another segment of the roof, BBC reports. Sunday's last official game at the century-old stadium ended with a 1:0 win of Levante, giving a bitter taste to the farewell fans bid to their beloved 'Cathedral'. 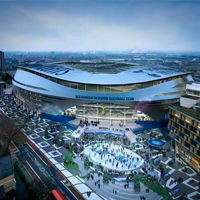 2013/14 season will be played at the new arena. 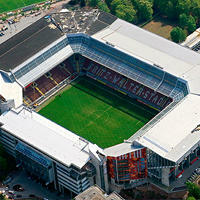 Exact design isn't known so far, but the ground is to be inspired by Amsterdam ArenA and Friends Arena in Solna. 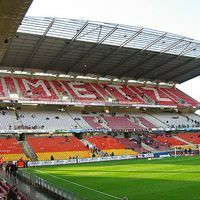 Construction will begin in 2016 and not later, because it cannot – this requirement was set by UEFA ahead of Euro 2020, which Brussels hope to host. 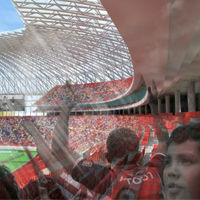 26.05.2013 Innovation: Mobile stadium for 50,000 people?! We've already seen the idea of a floating stadium, able to travel between port cities. Now it's time for a structure holding 50,000 that might fir into just 38 containers and be transported across countries or continents to host various events. It's expensive and cheap at the same time. 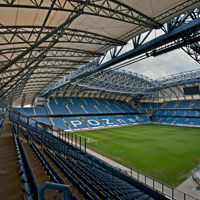 With attendances well below sell-out crowds, Lech Poznan went into the red over the Euro 2012 stadium lease. New conditions are more lax and give the club a chance to build on the new venue without overloading its budget. 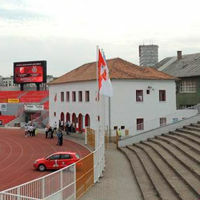 As Serbian newspaper Kurir informs, many fans could hardly accept the fact, that the famous club house of Vojvodina is being destroyed. Its distinctive arcades were welcoming players entering and leaving the pitch for years. 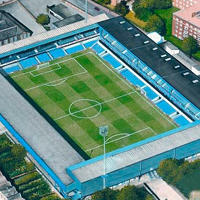 Demolition work is almost done at Albert Flórián Stadion, authorities shown the progress to journalists today. 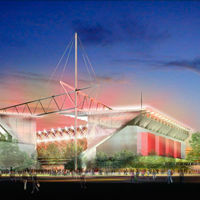 And the new venue will be built partly using the old concrete – a way towards sustainability and supporters' sentiments. 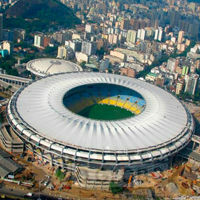 When the famous Maracana was built, some families had to support the investment with private funding. For this they were granted the right to have a seat at Maracana for any event ever, providing they'll be willing to cover annual seat cost. Now FIFA says they won't be able to see neither the Confederations Cup, nor the World Cup. Businessweek.com report. After months of consultation the final application is supposed to be ready shortly and submitted to the local council. 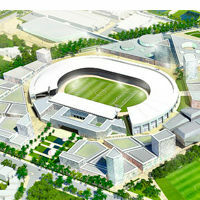 Brentford FC hope to go ahead with their Lionel Road plan, yourlocalguardian.co.uk reports. 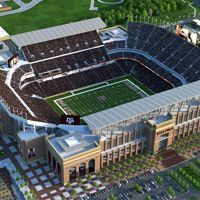 One stadium awaits replacement, while two others are just a year old. Turkey is changing so rapidly in terms of sports infrastructure. We'll keep visiting this country from time to time, hopefully! 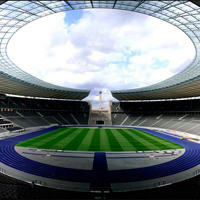 Olympiastadion in Berlin will host the 2015 Champions League final, while Warsaw's Stadion Narodowy will see Europa League finalists' clash, UEFA announced today. 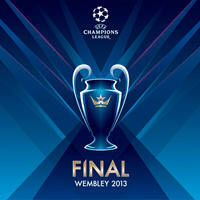 23.05.2013 London: UEFA's restrictions spoiled Champions League final atmosphere? Fans of Bayern and Borussia had great plans for Saturday. A choreography that covers over 20,000 fans is something able to make any game memorable. But no such thing is planned any more, because of UEFA's policy of not disturbing corporate clients. Both the names of their towns and the stadiums themselves are very nice and have a certain charm. No wonder, they may be small, but together have almost 200 years of footballing history, which you can feel by just taking a look. Here they are, as requested by our readers. This is surely one of the longest lasting projects. 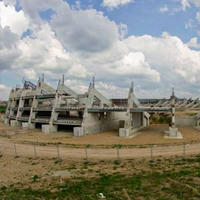 With groundbreaking back in 1987 the national stadium of Lithuania is still not even half way done. Now ministry of interior plan to get it up and running by 2016. 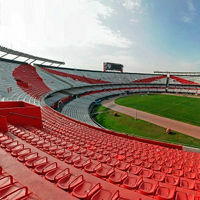 Very last stadium for this year's Confed Cup is ready. Or at least operable and will see its first real football game tomorrow. 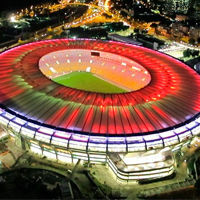 Surely one of the most interesting venues for both Brazilian tournaments! 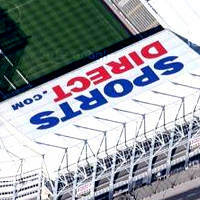 Newcastle United announced today that large logo of Sports Direct will be removed from south end's roof ahead of the upcoming season. 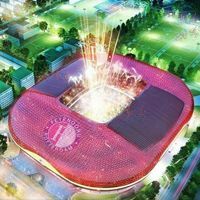 Many fans are enthusiastic to see what the club call “returning the stadium to fans”. 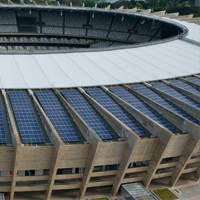 Formally the stadium was reopened in late 2012, but now a second opening took place, one of the solar power plant placed atop the stadium. From now on the arena will supply energy to the municipal power grid. Currently they're illegal, but David Gold is sure about introduction of standing areas soon. 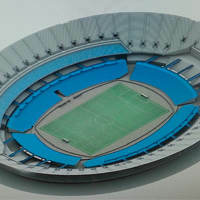 He expects his club to provide such sections shortly after moving to the Olympic Stadium. 20.05.2013 Saint Petersburg: Opening in 2017 in 'best case scenario'? 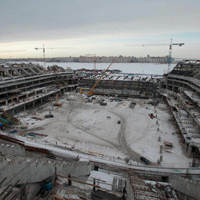 Russia's federal Audit Chamber claims the new stadium will not be delivered in 2015, but – at best – in late 2016 or early 2017. The city opposes such views and assures 2015 is still the plan. 20.05.2013 Warsaw: 2015 Europa League final already decided? 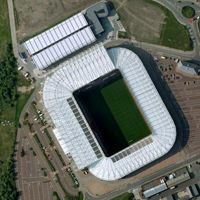 The decision is to be announced later this week, but Polish media outlets assure it's already settled and Stadion Narodowy will host the Europa League final in 2015. 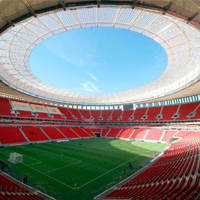 Last stadium formally opened ahead of June's Confederations Cup is finally here. Not through with construction yet, but with first game played the first test has been passed! There wasn’t a game at the third tier of the football ladder in French history that would get a crowd like this one. It may still be well behind global records, but 18,500 people at a regular game still sounds impressive! 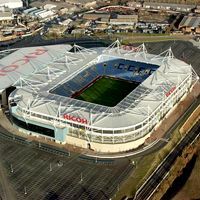 After a year-long quarrel about terms of using Ricoh Arena, Coventry City announced the club has left the venue and will not come back. 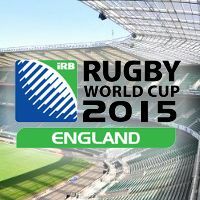 Upcoming seasons will be spent on other grounds, while a new stadium is expected in 2016. PA Sport reports. 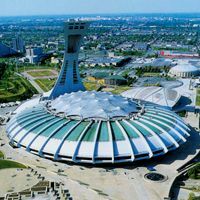 18.05.2013 Montreal: Olympic Stadium at risk of collapsing? 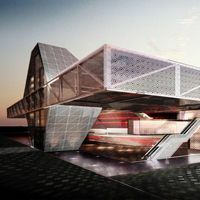 Designer of the famous futuristic venue in Canada appealed to the Premier of Quebec that repair works have been further deteriorating the condition of his structure instead of improving it. In his opinion this poses a “major risk”, sunnewsnetwork.ca informs. How to cool down 80,000 people in Qatar's summer heat? And without using any electricity at all?! Tangram Gulf presented their ideas, check them out. Also, be sure to take a look at Qatari league champions' new stadium, covered with Ferrari membrane and with a mosque inside. Really something, in both cases! And literally unbelievable – many people laugh at the plans they think cannot become reality. 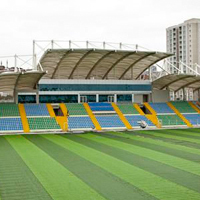 Indeed, the stadium is far more impressive than any other presented for any Romanian city to date. But Craiova mayor insists she wants to make it the biggest thing under her reign. 16.05.2013 London: QPR to announce move details soon? New stadium will be sponsored by Air Asia and hold twice as many fans as Loftus Road. 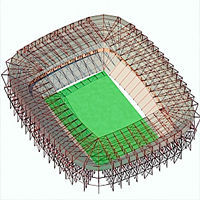 Construction may cost up to £150 million, according to The Sun, who expect the club to show details soon. 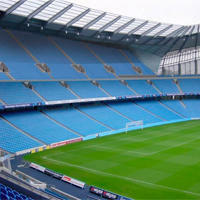 16.05.2013 Manchester: City announce expansion plans! The club scheduled consultation opening for next month in order to expand the south stand of Etihad Stadium for 2015.Eventually the ground will grow by 12,000 seats and these spots are hoped to be in affordable pricing. 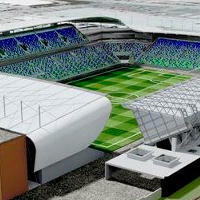 16.05.2013 Belfast: National stadium revamp threatened? 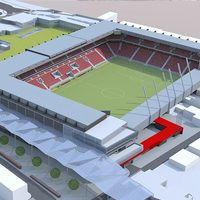 It seems so after U.tv reported Crusaders FC challenging the redevelopment of Windsor Park. The club claims it would be state aid to their derby rivals, Linfield FC. Though the survey itself was called a mockery by many fans, its outcome gives a strong argument to West Ham United. 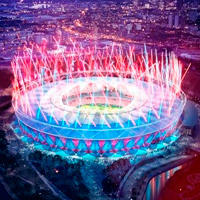 The club now boast that only 5% of fans are against the relocation to Olympic Stadium. They have a chance to return to the Bundesliga and supporters are there to help them. FC Kaiserslautern didn't even manage to start open sale of tickets as fans grabbed over 40,000 cards in two days. RP-Online.de report. 14.05.2013 New design: The world's largest transparent roof? 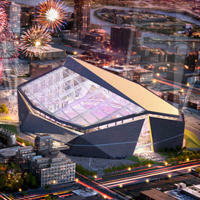 “Clear is the new retractable”, said Bryan Trubey of HKS Architects during yesterday's presentation of the final vision for Minnesota Vikings. But the truth is less visionary – retractable roof was more expensive than one covered with glass. The scheme resembles movie scenes from 'Ocean's Eleven', claims ewn.co.za. 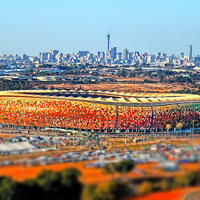 Safe at FNB Stadium was broken into just after two lucrative concerts and before money has been even counted. For the first time in history football supporters managed to list their stadium as valuable community asset. This means it cannot be sold to anyone the owner wishes to. Now Liverpool FC and Manchester United wish to follow suit, BBC informs. 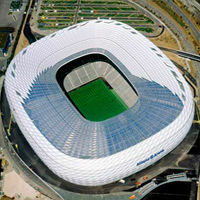 One more stadium for Bayern will be built near the current Allianz Arena as part of the club's football academy. It's going to serve all youth, female and reserve squads. He was supposedly hanging a flag, when he lost balance and fell off the stand, plunging 40 meters down. Guillermo didn't die on the spot, paramedics managed to get him to a hospital. This is the 84th person that lost a life after incidents at Monumental. City mayor and club president met to discuss the future stadium. 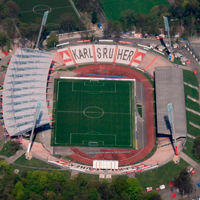 Whether the outcome will be a new arena or complete revamp of existing Wildparkstadion remains unclear. All possibilities are to be examined by Autumn, according to ka-news.de. Police claims that lighting flares on a balcony of high-rise apartment building should be treated just like the same incident inside a crowded stadium. 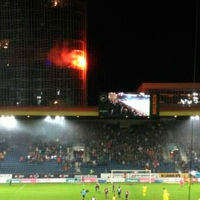 So they're investigating who lit pyrotechnics after FC Luzern defeated Young Boys Bern. 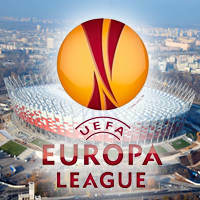 13.05.2013 Euro 2020: Budapest to bid, will host for Central Europe? 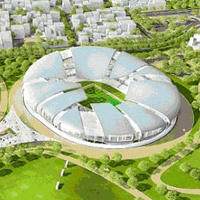 Hungarian football association confirmed their plan to submit new national stadium as a Euro 2020 venue. 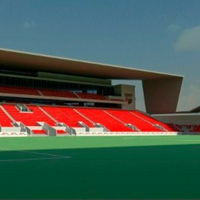 Its capacity and location may bring European Championship to the footballing legends for the first time. First one may seem familiar, because it combines features of several previous works by Tomas Taveira. But the other is a lot more fresh. Cheaper, smaller, but really original! After Ali Sami Yen, now it's another of the cult grounds of Istanbul passing to history. 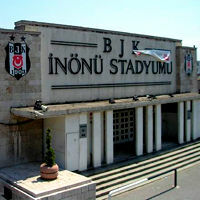 Fans of Beşiktaş sold out the 33th round game and afterwards took whatever was possible as souvenirs. Now it's time for redevelopment to begin. 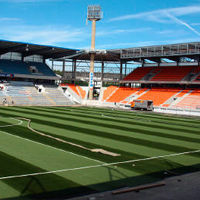 12.05.2013 France: Lorient to relocate to a new stadium? 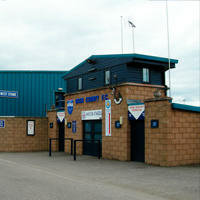 The club is developing and has ambitious plans. Changing their stadium comes after the new training complex is under construction. 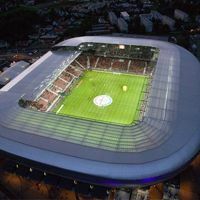 But would the public-private partnership see FC Lorient actually leave Lorient? 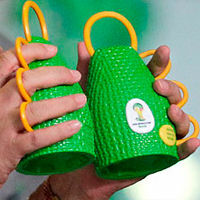 Tomorrow's Copa Bahia final will see caxirolas (official 'instrument' of 2014 World Cup) banned more than a year before the tournament starts. Brazilian sports minister says it's bad news, but we beg to differ! 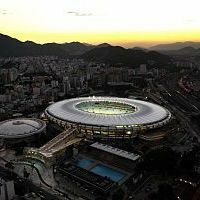 Prosecutors agreed with lost bidders that Rio de Janeiro state may have broken the law, by choosing the very same company for future stadium operation, which prepared the entire viability study for the procedure. Yesterday saw ceremonies and prayers as twelve years passed since the fatal derby between Hearts of Oak and Asante Kotoko. 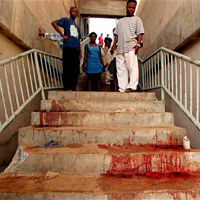 It was the biggest tragedy of African football and one of the worst ever with 127 people dead. What changed? Another phase of preparatory works begins as Rudolph's night closes on May 19. The cult place will serve fans last time after almost 40 years, tottenhamjournal.co.uk reports. New stadium is getting closer. 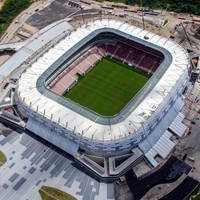 Billionaire Eike Batista grabs 35-year tenancy over Brazil's most famous and largest stadium. 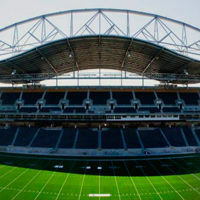 Competition argues his partners had unfair advantage, while other are still outraged that the stadium is 'given away' to private companies for free after having spent over $557 million of taxpayers' money. 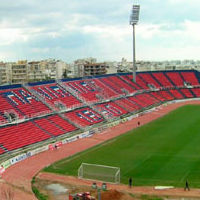 When information about Panathinaikos hosting their play-off at Panionios's stadium was announced, radicals threatened to make the pitch unusable to relocate the fixture. And so they did, but in the end the game was played anyway. 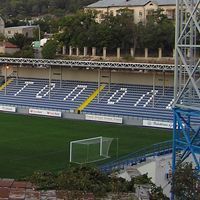 Ukrainian President Viktor Yanukovych has instructed the honorary president of Sevastopol football club and businessman Vadym Novynsky to address the issue of the construction of a new stadium in Sevastopol. Interfax information. 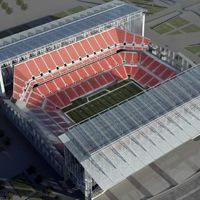 It’s expected to house 25,000 people. Not impressive? 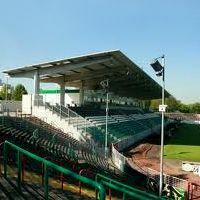 But it also costs €145 million, roughly twice as much as stadia of this size are built for. And German contractors only had 16 months to build it. They’re doing very well and will be done this year. Where’s the roof on this one? We may still be treated to increases as construction is hardly done. Just on Monday state authorities approved another large increase of the budget, according to SID. 08.05.2013 Brazil: Opening venue to be built last? 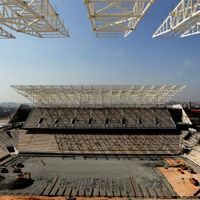 Though it’s only May now, we already know that construction works at Arena Corinthians won’t be done until February or even March 2014, just 3 months ahead of the World Cup. Even in South Africa deadlines weren’t exceeded so far. 07.05.2013 Madrid: This is Real’s future? 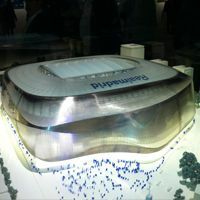 Although we’re still weeks away from official announcements, Spanish ‘El Confidencial’ claims to have leaks confirming the final design of Estadio Santiago Bernabeu. The supposed winner is GMP Architekten from Germany. 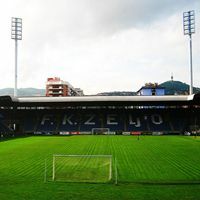 Tonight’s clash between Željezničar and FK Sarajevo may turn ugly. Or so think officials who requested to remove seats from away section, according to Radio Sarajevo. Despite Feyenoord’s determination to leave De Kuip and build a new stadium across the street, ‘Save De Kuip’ campaign isn’t giving up. Enthusiasts of reviving the existing De Kuip have just published their extensive report on the idea and will present it to city officials. 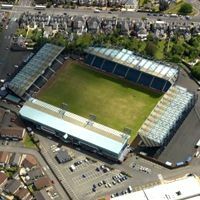 Scottish Premier League fixture between Kilmarnock and Hibernian was stopped in 54th minute and abandoned after a life-long supporter collapsed. Despite paramedics’ effort he died. Wednesday will see first Cup final without either Crvena Zvezda or Partizan since the end of Yugoslavia. 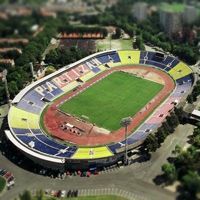 The match will still be played in Belgrade and Vojvodina Novi Sad plan an invasion – they’re offering tickets and transport to their fans for free. 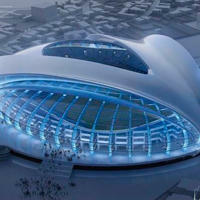 05.05.2013 Qatar 2022: FIFA approves limiting stadium number to eight! 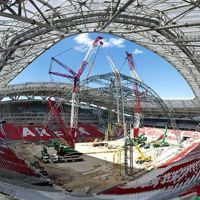 If the decision passes, 2022 World Cup will be the smallest stadium-wise since 1978, when the number of teams was twice smaller. 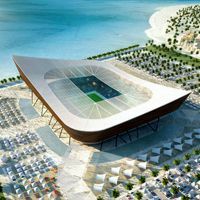 Is FIFA undermining its credibility by accepting Qatar’s request to cut the list to 8 stadiums? 05.05.2013 Sydney: Olympic Stadium’s future uncertain? 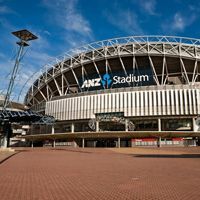 ANZ, current naming rights owner and operator of Sydney’s largest stadium, threatens to cut their lease of the ground short if government refuses to renovate ANZ Stadium in time, Daily Telegraph reports. 05.05.2013 Hague: What caused intoxication in a skybox? 13 people had to be taken to hospital after they suffered from nausea during their visit in one of the skyboxes at ADO – Feyenoord game. It’s not clear so far, what caused the intoxication. You’ve seen stadiums with retractable roofs, you’ve probably seen those with mobile walls, too. But have you ever seen a building that completely opens up, revealing stands for 65,000 people? Well, you’re just a click away now! 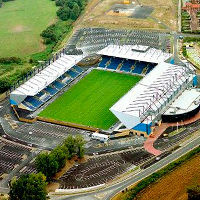 04.05.2013 Coventry: City to leave Ricoh Arena for 2013/14? 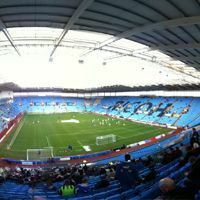 Strong words were used by both sides, as Coventry City director claims his club is ‘locked out’ of Ricoh Arena and the stadium authority accuse him of acting against the club. Will Walsall be Sky blues’ home next season? 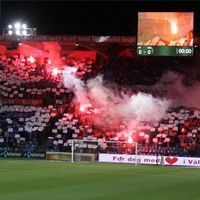 Despite declarations that flares will be allowed inside stands again if no incidents happen until the 5th round of Tippeligaen games, regulations still forbid fans from lighting them. But according to Vålerenga’s website talks are ongoing. 03.05.2013 New design: Third 100,000-seater in Texas! First major re development in Slovakia has just began. Not along the design from a few years back, but a new, perhaps more impressive one. 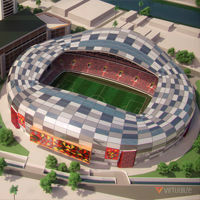 Stadium conjoined with ‘City Arena’ shopping mall will be cost some €76 million and be built with private funding. 02.05.2013 Qatar: 2022 World Cup to improve labour rights or fall victim of strikes? Worker protests delayed World Cup preparations in both South Africa and Brazil. Meanwhile, the situation is even more severe in Qatar, where workers are treated like slaves, according to trade unions. A CNN report. 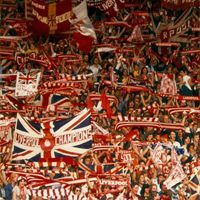 It’s arguable whether it was the first Kop ever, but none other ever got so much praise. It was exactly 19 years back, when fans gave their farewell to the world’s most famous terrace. Its legend is still alive today, but hardly comparable to pre-1994. 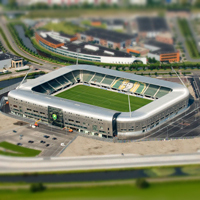 01.05.2013 Poland: Polish Cup revival after half a century? 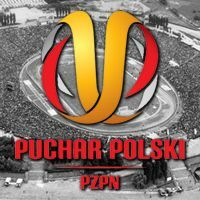 Tomorrow’s first leg of this year’s Polish Cup final will witness crowds not seen in over 40 years. Together with 2nd leg in Warsaw the tie between Śląsk and Legia may deliver attendance that happened only once in history.